Next Sunday we begin our Holy Week observances with Palm Sunday. The rest of Holy Week will be different than in recent years, with a sit down soup-and-bread meal with readings and communion for Maundy Thursday (reservations required so we know how many to set for), and Easter Breakfast followed by a 10 a.m. celebration featuring an Easter pageant and plenty of uplifting music on Easter Sunday. 10:00-11:00 a.m. Worship, featuring a new Easter “Pageantette” and music from the Adult Choir, dbdb, and more! 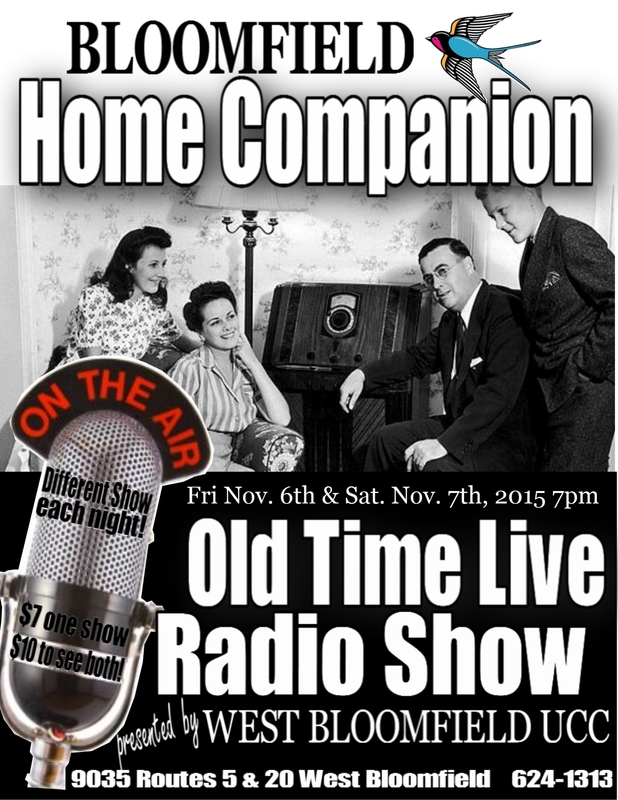 West Bloomfield Congregational Church presents BLOOMFIELD HOME COMPANION Old Time LIVE Radio Show on Friday November 6th and Saturday November 7th, at 7pm both nights. Our show is fashioned after Garrison Keillor’s Prairie Home Companion, featuring a real live sound effects lab courtesy of the Antique Wireless Museum, fun old-time and newer “radio” plays, goofy costumes, jokes and laughs, and music from our house band and several special performers (including Steve Gretz and Leslie Lee) $7 for one show/ $10 for both nights. It’s an entirely different show each night. Refreshments at intermission. Handicap accessible. 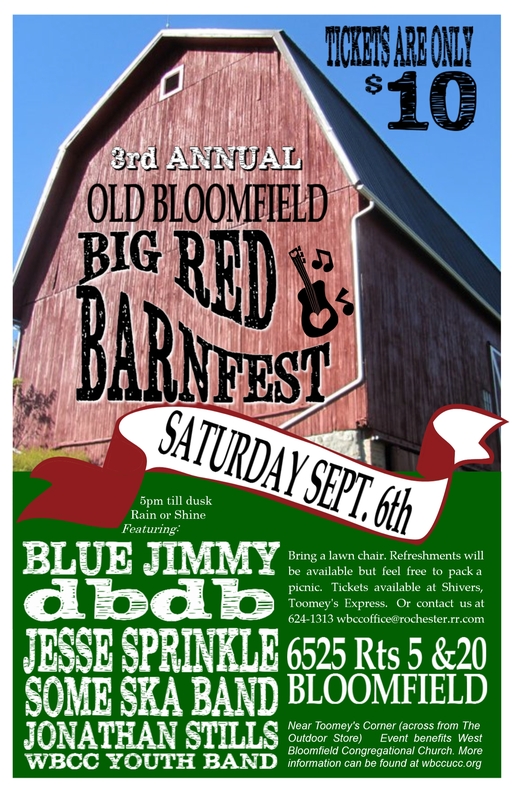 WBCC is located at 9035 Rts 5 &20 in W.Bloomfield. Please call 624-1313 or contact us at wbccuccoffice@rochester.com with any questions. Come on out to West B loomfield Congregational Church for our annual Service on the Lawn on Sunday June 14th at 10am with music from dbdb. Sticky Lips BBQ available from 11:30am -3pm. Eat in or Take out. Music from Dirt Child live on the lawn at noon! BBQ is $13 pre-sale/ $14 day of. Dinner tickets available at Cheap Charlies, Toomey’s Express & Shivers in Bloomfield, Dapper Dans in Honeoye Falls and As We Grow in Canandaigua till 6/11. Also available at Honeoye Falls Market Place on May 30th from 10-2. Bake sale! Bouncy House! Face painting! Rubber Duck Raffle! Lawn games!